In a time of Google Maps, Geo Location and other services like this... 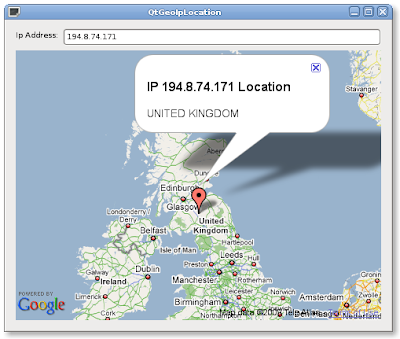 Here an example of Geo IP Location Service (http://www.hostip.info/) is really far from perfect, but it's just an example. The sample uses QNetworkAccessManager to get the Geo Location of the IP, and Webkit to display the address on the Google Map. The Source Code is available Here: Qt4 Geo IP Location Source Code. I have create the sameone for kde using marble api . The difference with you is , it can works without connection. It downloads automaticly a database on hard disk. WebmasterToys's IP Lookup is brilliant. I found it very helpful in determining the location of any IP.